Hey Girls! Do you watch GIRLS? Here at TSS we watch girls religiously! Can you guess who our favorite character is? Well, even though we know there’s a little bit of Hanna, Marnie, Shoshannah, and Jessa in all of us we mostly identify with Marnie Michaels; the glamazon prepster who is always simultaneously optimistic and down on herself; played by Allison Williams. For the upcoming 3rd season, premiering on January 12th, 2014 on HBO – be prepared to see a different side of Miss. M.! A side that is not so optimistic and a bit down in the dumps since her friendship with Hannah (played by Lena Dunham) is on the rocks and the so called “love of her life” Charlie has seemed to have disappeared into thin air! In addition, her career in the world of art seems to be a bit lackluster since in the real world and reality of job hunting, in this economy it’s “good luck to everyone” these days; leaving the character unsure of where her life is heading. As we all know, this kind of lifestyle for Marnie is a huge topic of stress related meltdowns. 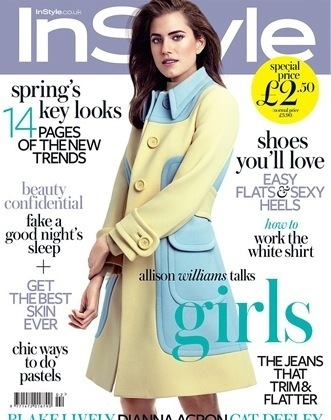 Allison Williams, the beautifully bright eyed actress taps into her Marnie character for the February issue of InStyle UK! Gracing the cover, Williams dazzles in a very pastel shoot inspired by spring’s best ensembles designed by Isabel Marant, Michael Kors and Burberry. The elegant, sophisticated, young at heart and lady like shoot is parallel to the persona Williams portrays both on and off screen! She is the perfect Style Senders girl!